Want to earn part of all your living from a farm? You are at the right place. Our farming areas all have a long future ahead of them and we can't wait to welcome you to the neighborhood. We are here to make your buying experience a great one. Be sure to check other pages for properties that are somewhat larger or smaller than this as you may find something just right there. And don't forget to look under "Country Living" as well. Some of the "Acreage" properties have barns, so if you don't need a home, that is another spot to search. Want complete and utter privacy? Views? A real homestead? Look no further than this Amish-built farm that has had many updates from it’s inception. The property lies down a private lane .7 miles from the main road. The lane only goes to you and to no other homes. 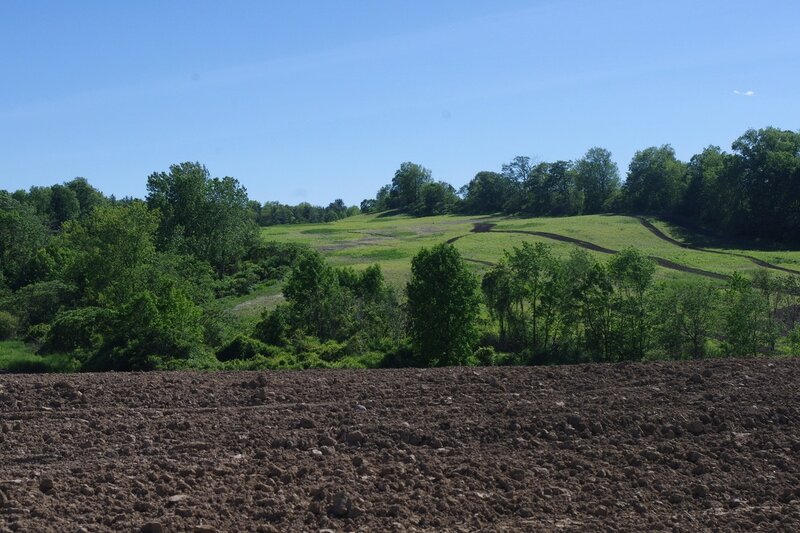 lThere are 106.3 acres here and the owner says 50 of them are tillable, in corn and new hay seedings, high lime Palatine and Wassaic soils, with Nellis in much of the woods. These are among New York State's very finest. The remainder of the land is divided between pasture and woods, with woods being the greater half. In the woods are about 500 tappable sugar maples, also hickory and beech, along with some cedar and hemlock. Many trees are 2’ or more in diameter. There is a stream through the pasture and woods and it ends at a large creek, also on the property. Water for the home and barns is from a new 190’ drilled well - no sulfur either. 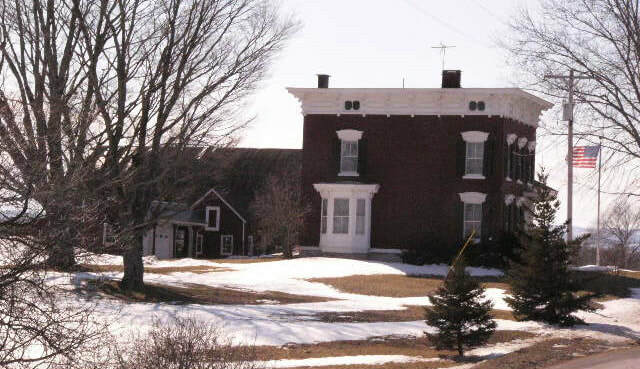 The home was originally built as an Amish residence in 1986 and has 1920 square feet of living space plus a full dry walk-out basement. All full-dimension lumber was used. The owner has recently painted both the home and barn, put in new wiring, a new septic, new windows, new roof, R30 insulation in the attic, new kitchen and bath. He will continue his remodeling until he has finished or until it is sold. If you buy before everything is finished, he will negotiate the price downwards and give you credit for the money he intended to spend but didn’t have to. The home has a wrap-around porch, summer kitchen (w/wood cookstove), and an attached woodshed. Inside is a new oak galley kitchen, pantry, dining (with 2 sets of double French doors) and living rooms plus a bath and the master bedroom downstairs. On the second floor is a large hall, 4 bedrooms and a huge planned bath. The main barn is 38x90” and has a flat drive-in entrance to the loft, no beams in the way either. In the stable are 27 stanchions and an addition approximately 30x40’ with 7 straight horse stalls and 2 pens for smaller animals. Like the home, it has had French drains installed so it stays dry. It has 2 14x40’ silos. In the barn is an ice house which keeps ice through the summer. Youngstock have been housed in a section of the machinery shed. This building is about 30x70’ and has a corn crib across the west end. There are some small buildings for typical other farm purposes. And there is a sugar house just inside the woods. There is also a second home which has just started construction. It is 24x44’ and is planned to have 2 12x12’ bedrooms, and a single bath. Across one end is a 14x24’ shed which will function like a huge mud room. The price when completed will be $350000. As there are several figures on the acreage included, ranging from 98 to 120 acres, the owner has contracted a surveyor to survey the entire property. Until this is done, I will use the County’s figures of 106.3 acres. Included are all woodstoves, all appliances, 3 generators, and snow fence for the entire drive. Available separately are his machinery: New Holland 55 Workmaster 4WD tractor, Ford 9N tractor, sickle bar mower, good JD 328 baler, 2 hay rakes, a tedder, drags, a tilt-bed hay wagon, Ford 3 bottom plow, 4’ bush hog. #1111 - Central Montgomery County - Cropper's Delight! We have 147 acres of outstanding soil, certified organic, and at a low elevation for a longer growing season. 107 are tillable, 3 large fields. We have an outstanding tenant who is willing to continue his tenancy there. (More land can be rented too, across the road.) The remainder (40 acres) is wooded and it is estimated that $1000 of timber is there ready to harvest, mixed pines and hardwoods. areBut maybe you don't want to do crops yourself. Let me tell you more. There is 2300' of road frontage on a seasonal road – no neighbor homes can be seen from here; it has all the privacy that anyone could wish for. And the views are to die for. You look up and down and across the valley. Montgomery County's most famous natural sight, “The Noses”, are right there before you. There are two buildings. One, called a “bunkhouse” has a 10x20' second story bunk area, with a storage room of the same size below it. Then on the side is attached a 10x30' open area under which is housed a 35' camper. A deck is off it and there is a formal firepit for those evening barbeques. The camper sleeps 10, has a bump-out, and could be purchased for an additional $4000. It has a new HW heater. Along the drive in to the bunkhouse is a new 30x40' 4 sided machinery shed and a 220' drilled well. The well has a pump at 185' and the water's static level comes within 40' of the top. Taxes are $3700 and the price is just $275000. You can't find quality soil with this kind of privacy and scenery anywhere else. #1122 - Western Montgomery County - In the midst of the Amish community and a short distance to the Produce Auction is a 132 acre farm with up to 105 tillable. Decent soils too, black silt loams. The land has not been used in a number of years, a shame - but the bright side is that it qualifies for organic. The remainder is abandoned pasture. Although there are trees, nothing is really wooded. There is a stream in the back, a creek in the front, and there are 1800’ of road frontage. 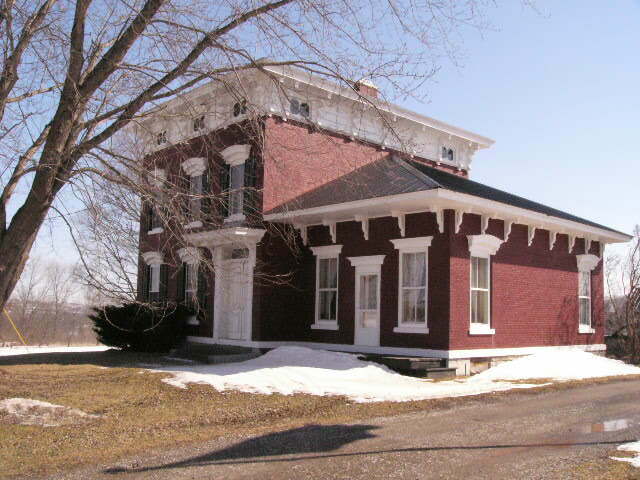 The home is an 1860 classic Brick Italianate of 2412 sq. ft and although used part-time by a single man, it is in good or better condition with a nice view across the creek valley. It is serviced by an updated 4 zone oil furnace and has a security system and a dug well. Inside, the kitchen has new cabinets and appliances. Floors are refinished wide planks. There are 8 rooms total, 3 bedrooms and 2 baths. Years ago, the home had a one BR apartment and that could be changed back if desired. the third floor is a walk-up attic and could be refinished for substantial additional living space if you didn’t mind abbreviated head room along the outside walls. The view from there is even better. The barn has a block foundation and a Gothic arched roof. In good condition, it is 36x96’ and has 2 large pens in it now. It can be easily converted to horse, cattle or small animal stalls. There is also a fairly new 24x36’ garage. It has 3 doors with openers, and a concrete floor. ​$425000 and the owner is anxious to make a deal. It is only 1 mile to town, less to school. Adjoining this, 12 acres more land with a horse barn and an occupied mobile home may soon be available. It has 8 acres of very good woods. Larry Casler is the person who knows the most about this property. I suggest calling him directly: 315-823-2970. You need to “Open the Book” here and not judge this by its cover. We have a large home that has been VERY extensively renovated on the inside while little has been done to the outside. You will be very pleased when you see inside, guaranteed. ​The land is sort of the same way. Pastures not used, so they look their worst. But go through them to the 50-60 tillable acres of land beyond, and it's a different story. That is well-kept by the tenant farmer. There are 135 acres here, in all. 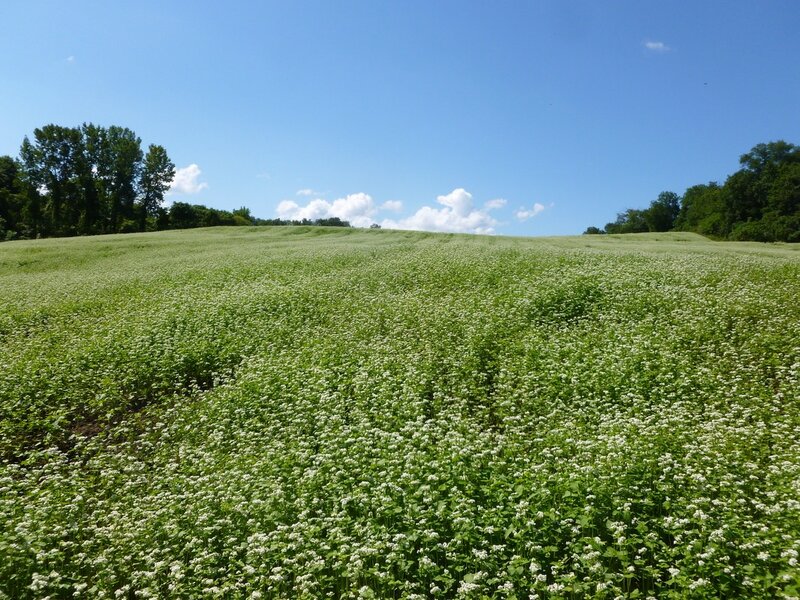 50 are wooded, 25 pasture and the remainder mostly tillable in the high lime and better-drained Wassaic soils. A small stream runs along one border for a while. There are wetlands here, mostly in the woods, that may qualify for significant government payments. There are 2 developed springs and a very good drilled well for water. The home is surrounded by large maple trees and is quite verdant. It has some very large and useable rooms. The kitchen/dining room is 14x32', with new cabinets, black walnut countertops, ceramic tile floors (and wide plank at one end). Although there is quite a bit of cabinet space (and 2 sinks! ), there is also a large pantry. You fill these with food and you won't have to go to the store for months and months! The living room is 14x20' and has oak floors. There is also a downstairs bedroom and a full bath. In the back is a very large room which has historically been used for a variety of purposes. It could be converted to a one car garage. Behind it is a 10x18' woodshed. Upstairs are 5 rooms plus a large ceramic tile-floored bath/laundry. Three of these are bedrooms (14x21', 11x14', 14x17'), 2 of which have oak floors. The others have plank floors. The master bedroom has 2 6' closets. The home was just completely rewired and replumbed, insulated fully and had new windows installed. There is a new septic. All the old plaster was removed and new sheetrock installed. Most doors are new as well. Baths are brand new as are the kitchen cabinets. There is plenty of closet space. 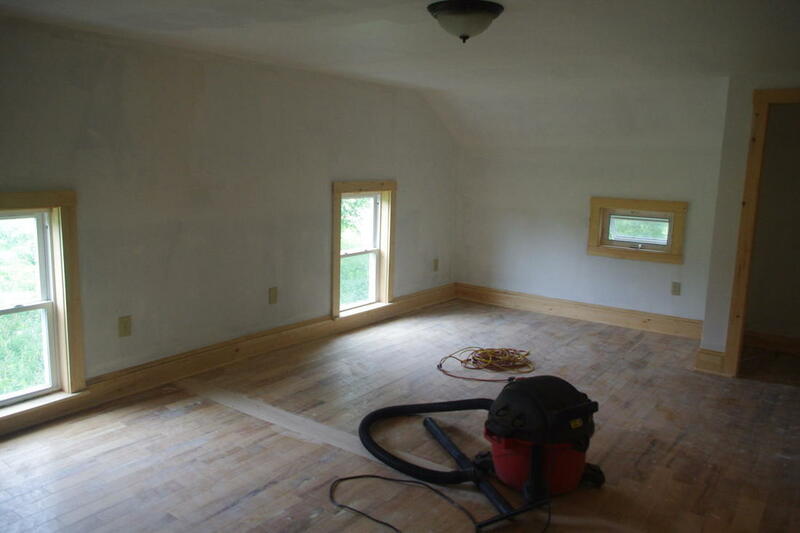 Except for the fine old plank floors in the original old part of the home, the majority of the floors are new too. The home is wonderfully livable as it is, but there is minor finishing work inside that needs to be done. Heat right now is by woodstoves (a new and beautiful “hi tech” wood cookstove is included just to make the deal sweeter for you – as well as warmer. ​The former dairy is old, and tired. It needs a roof as winds have stripped one section off a while back. It is roughly 40x130' with a 26x30' “L”. Part is single story and clear span but most is post and beam, using big old hand-hewn beams. There is a milkhouse attached and a new 14x40' silo.. There is a 20x80' equipment shed, which has also housed heifers in the past, and a 22x30' storage barn. ​Taxes are $5226.88, with no deductions taken, and the price was reduced to $325000. This is a property designed for FUN and it is just about perfect if you like to entertain. There are 103.4 acres and part of it is your very own mountain! There are trails through, good hunting, and 34 acres of hay meadows, with the remainder mostly wooded. Maybe 4 acres are strictly pasture. A small stream glides through, three is a good pond site, and there are views from the rolling fields everywhere you look. ... And then there's the home, what a home! This “shoes off' home of 2874 square feet of living space has an open floor plan so it feels even larger. The construction and execution of this home are clearly superior. The Great Room is 30x30” and it features a wet bar and a unique raised ceiling in the center. Within the raised ceiling is a stunning panoramic mural of the surroundings. Many windows face the south and the mountain views it affords. A side door lead to a sauna. Double French doors lead to the living room/dining area. This has a cathedral ceiling and a circular stairs leads to the second floor. The kitchen is open as well. It features oak parquet floors and black granite countertops and backsplash. There is a washer and drier hookup here as well as in the basement. The master bedroom, a full bath, and a walk-in cedar closet are all downstairs as well. The second story has a landing room, and 2 bedrooms plus a 3/4 bath. One bedroom is a 2 room suite. One wall has chalkboard paint so the kids can have fun and not hurt a thing. The hallway overlooks the living area. There is a large and dry basement with very high ceilings. A bath or more rooms could be added here if you wish. They have hot water heat and can use either the oil furnace or an outside wood furnace for inexpensive comfort. The garage is 30x30' and has workbenches along 2 walls, It is also heated and has 2 overhead doors. To its side is an enclosed front porch with a double door, allowing you to store lawn furniture, lawnmowers, snow blowers and so forth, or just use it as a front porch. The home's floors are mostly carpet, but there is also ceramic tile in part of the rec room. Outside is a paved circular drive, an enclosed front porch with double doors, a 19x43' ”Lazy L” shaped swimming pool, and a wraparound deck, which is partly covered. Separate buildings include a wood shed with a space to park a tractor as well. An 11 year old ' horse barn (32x32') sits a short distance away. It has 4 box stalls with room for more in space now used for feed and tack. 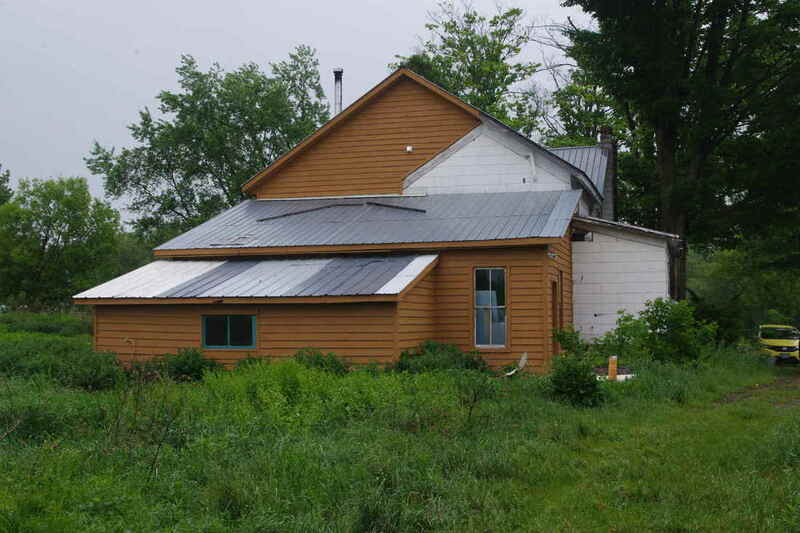 This barn has running water from the drilled well, and it has a 60 amp electric service. The price of $450000 includes the washer, drier, gas stove, refrigerator, bar stools, some curtains, and an old dishwasher. Taxes are $6800. 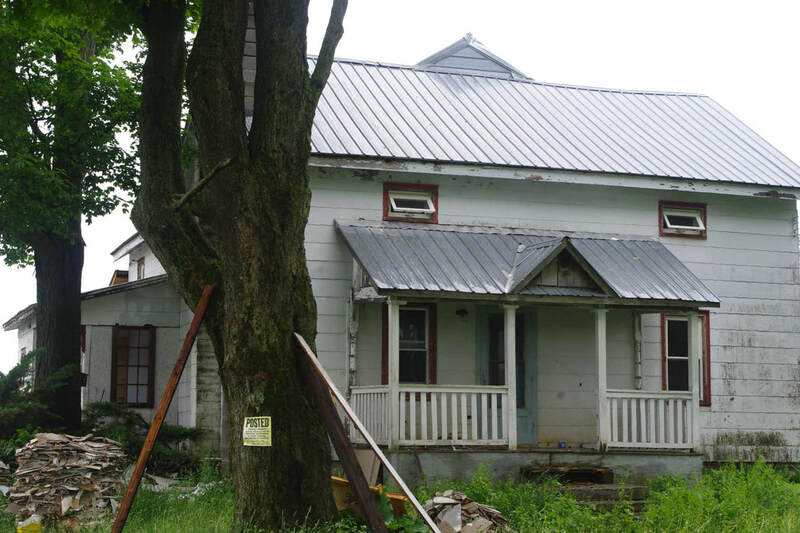 #1087 -North Central Montgomery County: Historic saltbox on 125 acres has been beautifully maintained and carefully modernized with an eye to preserve its unique character. It has been completely gone through, A-Z, in the last 25 years. There are 2648 square feet of living space in the home, which was built in the 1790's. It features two back-to-back original Rumsford fireplaces plus a third one upstairs, original woodwork, redone plank floors, great paneling, exposed hand-hewn beams, a Dutch bed... It has 2 modern baths, new windows, a figured Tiger Maple floor in the kitchen/dining area. This area has a larger counter separating the food preparation and consumption areas. The formal dining room is huge and has just a good “feel” to it, as does the living room. There is a mud room and a bathroom near the back door. Upstairs is another full bath and 3 bedrooms, one of which is very large, with dormers. Another large bedroom has a small fireplace. Heat is 3 zone oil hot water, electric is 250 amp, on breakers, and water is from both a 300' drilled well and a dug well. All appliances stay (newer refrigerator and dishwashers, plus stove, washer and drier). The barn is a modified Dutch barn, and was the subject of an entire issue of The “Dutch Barn Preservation Society Newsletter”. Moved here in 1889 from a nearby site, and added to and modernized at the time, it is truly unique. The old portion probably is as old as the home. It measures 44x70' with a 32x35' wing, has both basement and drive-in loft areas, 18 stanchions and tons of space. There is also an original 16x30' barn which has been variously used in the past for horses, for pigs and chickens. A 19x27' 2 story barn has been converted to a 2 car garage as it stands next to the home. The last building is a smokehouse. The grounds have been attractively landscaped and will be very appealing to anyone who spends their time outside. About ½ of the land is tillable, with well-drained and fertile soils which have always been kept in a good state of cultivation, with corn, hay and sun flowers planted this year. You will find great valley views from the fields. Much of the rest of the land are woods, which has some timber value now, but will have a lot more in 5-10 years. A seasonal stream goes the width of the property and another crosses near the buildings. You'll find 3600' of road frontage on a quiet county road and it is located within the sought-after Fonda/Fultonville School District. 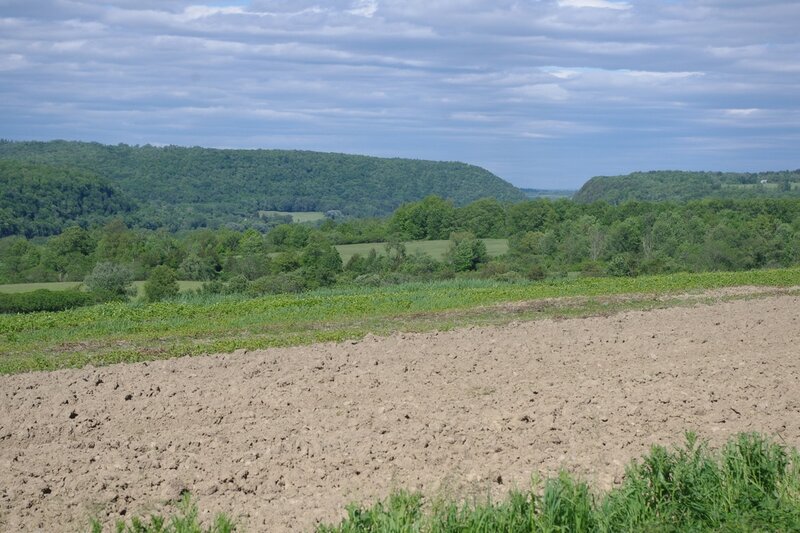 #1020 - Eastern Montgomery County - This Montgomery/Schenectady County farm of 112 acres has up to 60-70 tillable and is currently rented to a neighbor. $270000 for the 112 acres on the larger (north) side of the Additional land across the road (~42 acres, 25-35 tillable) can be rented or secured with a Right of First Refusal. This barn measures 36x80' with a 20x40' wing. There are 36 modern tie stalls, a bulk tank and room for young stock in the wing. 2 smaller silos. It uses a manure push off. Tbere are 2 small concrete silos. Be aware that there is a correctable structural issue in the barn loft, one which does not show in photos. You can drive to the Capital District in less than 1/2 hour from here, yet it is quiet and peaceful, surrounded by small farms. There is no home, but there are plenty of superior building spots. #1018 - West-Central Otsego County - Operating Otsego County dairy with potential rental income. This 122 acre farm is very pretty with a nicely landscaped lawn to boot. A trout stream winds its way through pasture and into the woods. The property is about 1/2 wooded and most of the remainder is tillable. Rolling terrain with fine views from the fields. Excellent hunting. There are 8335' of road frontage on paved County and Town roads, located west of Cooperstown. Three tax parcels comprise the whole. An Amish community is nearby. 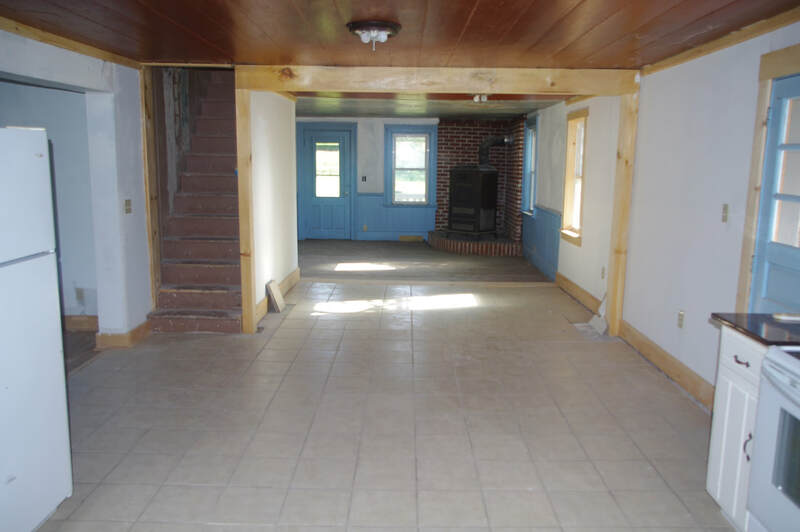 The home is an eyebrow colonial with 4 bedrooms and a single bath. It has a mud room and a large kitchen. The remainder of the downstairs is an open floor plan, with the bedrooms upstairs. Floors are carpeted. It can be heated with the included woodstove, but there is a new 93%% efficient propane hot iar furnace there to use as well. Electric, plumbing, drilled well, and septic (1250gallon) have all be updated. It has cheap REA electric, vinyl siding, & some replacement windows. All appliances are included (refrigerator, freezer, stove, dishwasher, washer and drier). There is a new roof and a new front porch. Horses (4 box stalls) and small livestock are kept in a 52x55' hip roof barn with 14' ceilings in both the stable and the loft. Gravity spring water is planned for this. The barn is used by a tenant who plays $150 monthly, with no lease. There is a detached oversized garage, once used as commercial shop, now used for livestock. 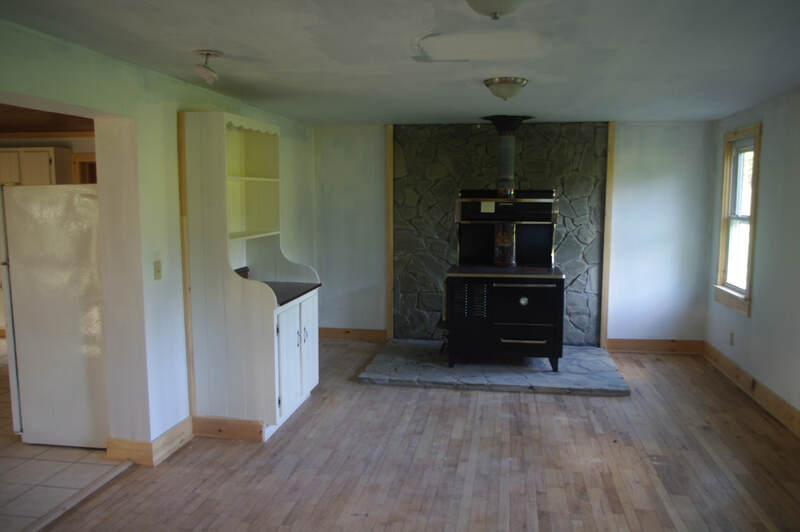 In a separate location is a 3 bedroom, 1.5 bath trailer with its own drilled well and septic. 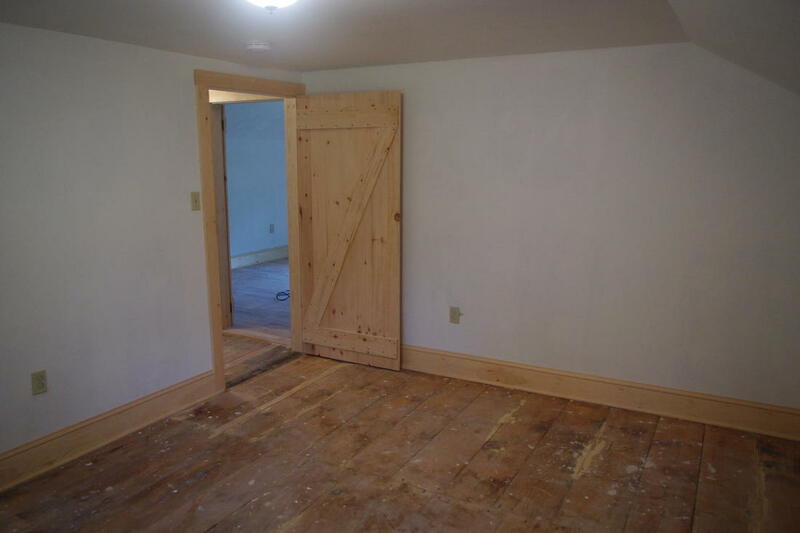 It is rented to a young Amish couple who suddenly needed a place ($350). If rented to someone else, it could bring in $600/month. Taxes are only $4400 and the price is $450000. After 14 years, the owner, who is disabled, has decided to downsize. Didn't find exactly what you wanted? We maintain good relations with our competitors and, even though they do not specialize as we do, once in a while one of them will have a place. If you spy one, let us know and we will work with it for you. You've spent the time to have me see things through your eyes. We don't have to give up our good working relationship.